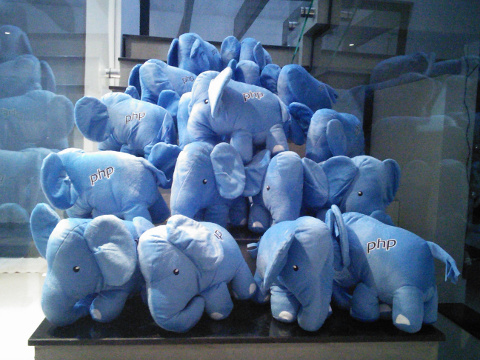 How to Win a Big PHP ElePHPant Plush Mascott Every Month? The PHP Classes site was created to give greater exposure to the work of developers that share their components in the form of PHP classes of objects. The role of PHP Classes is not to compete with version control repository sites but rather to distribute packages in a way that developers get more visibility to their projects. 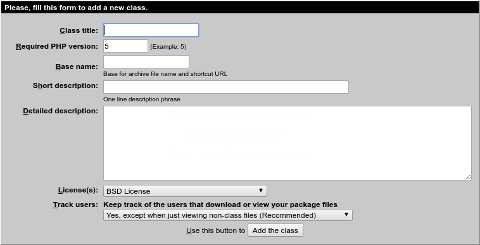 Nowadays, users can download package archives or even install packages using the Composer tool directly from the PHP Classes own Composer repository. Some people asked me, why publishing your package in PHP Classes when I already have it in GitHub? Well if you just leave your projects in GitHub and do not do anything else, not many people will be aware of your project. There are millions of projects in GitHub sitting there and nobody looking at them. Don't get me wrong. Having your package repository in GitHub is a good idea, but if you want to get the attention of many users to give you feedback, collaboration and recognition, you should also expose your packages in other sites, like for instance PHP Classes or others. So PHP Classes is not an alternative to GitHub or similar sites, but rather a complement to get you an higher level of exposure that otherwise it would be difficult to get without spending much time and effort doing the "marketing" of your code. Therefore, recently I started talking with many authors about how the site could be improved to get you more exposure and recognition with the least of the effort or complications. Read below to learn about the improvements implemented so far. Frequently I get requests from PHP developers that want to get an ElePHPant mascot like the one that PHP Classes gives to the Innovation Award Winners each year. That is a nice prize that many developers wanted to get, but like the contributor Isaac Trenado told me, it is very hard to win the innovation award of the year. So he wanted to buy one elePHPant. Unfortunately it is not feasible to sell these elePHPants of the PHP Classes site because the site company, Icontem, does not have export permission. That would require a complicated process to do it in full legal compliance. Also due to the size of the elePHPant, which is quite big, the shipping costs for individual units make it 3 times more expensive. That would make it hard to generate enough profit to compensate all the work of handling and shipping of many individual units around the world. Instead of selling, I decided to give away the elePHPants as prize for the innovation award every month. Since it is a gift, I do not need an export permission. It is not so much work to ship one elePHPant once a month. So starting with the winners of next month being voted this month, the elePHPant mascot will be available as prize for the award winners that pick it. They will get the elePHPants delivered to their homes without any cost. I am also considering including a special ribbon to be hung around the elePHPant neck, showing the author name, Innovation Award rank, year and month of the nomination. So if you also want to get your own big elePHPant, it is simpler now, just submit innovative packages now so you can be nominated and start qualifying to win the elePHPant. A notable package is a package that does something worth calling the attention of other users. A notable package may be innovative or not. When I, the moderator, notice a notable package, I write a brief text explaining why it was considered notable. 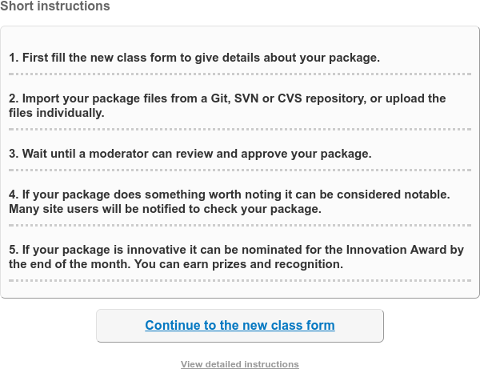 If your package is innovative and was also considered notable, you get much more chances of being voted and win the innovation award of the month. 1. The site sends a immediate email notice to many tens of thousands of users telling them why the package was considered notable. Many of those users come and see the package immediately because they like to know how those packages work and if they can be useful to them. 2. In the site blog there is now a category for notable packages. These blog posts are not notified by email because it would be redundant for users getting the notable package notices, but they can be seen by users following the site RSS feed. 3. In the latest entries page there is a tab now for the notable packages as well with a RSS feed. 4. In the site home page there is a list of notable packages, for now just for premium subscribers but later it may show to all users. One common complaint of some authors was that the package submission page had lengthy instructions that most people would not read. So from now on, the package contribution page was simplified. It has just a few sentences and a link to the package submission form page. The detailed instructions still exist but you need to click on a link to show them. The package submission form was also simplified. Options that are not important were omitted. Those options may still be set by clicking of the Edit link in the package page. This came to me as a surprise but the fact is that several authors appreciate the possibility to access the site pages from mobile devices, even when they want to submit their new packages. Most of the site public content pages are responsive since last year. However, there are some pages for performing several types of actions by logged users that were not yet adapted. That was the case of package submission pages until recently. So from now on, the package submission pages are responsive, including those that allow you to import packages from GitHub or other version control repositories. 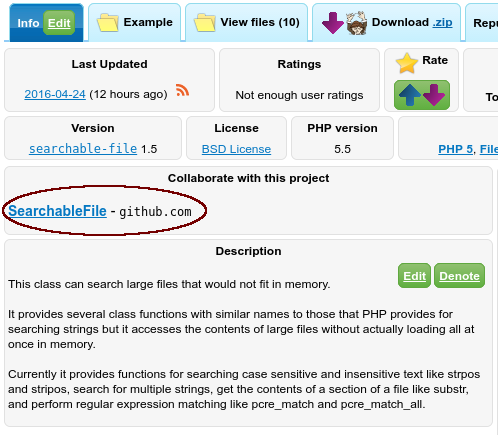 Since 2011 the PHP Classes site supports importing packages from Git, SVN (SubVersion) and CVS repositories like GitHub and others. Nowadays, it can even update your packages in the PHP Classes site automatically when you update them in their repositories, without requiring that you tell the PHP Classes to do it. However, until recently there was an issue. The site required that you entered the file roles and descriptions of new files manually. That was a big burden for authors, especially with large packages. Now that problem is solved. The site can analyze the files, automatically guess the file roles and assign a description to them without the need for the author to do it manually. The file roles are important for rating packages. For instance, a package can only be rated for its examples and documentation if these files are present in the package. Also the site needs to know which are the class files, so it generates correct class maps for those installing packages from the site via Composer. Anyway, now the site will automatically guess the roles of your package files. You can confirm if the guesses are correct later if you want to. Last year I became ill. I had to take medicine that made me unusable for the beginning of my day. This started causing delays to the approvals of packages. There were times there were more than 40 packages in the queue. This caused great frustration to the authors that wanted to have their packages approved right away. To minimize this problem I have implemented a new approval process based on a suggestion from Samuel Adeshina. I just look at the packages to see if they are really made of classes of objects in PHP and approve them right away, typically in a few hours, no more than 24 hours. Usually I need to elaborate better descriptions because many authors provide vague descriptions that do not tell much about all their packages do. I also need to analyze what the packages do to see if they can be considered notable. So there will be a second step of package review, which may take a few more days. This is still not ideal but at least the packages will be approved and published quickly in order to be viewed and download by other users as soon as possible. In the future I may have a process that can include more volunteer moderators that will help me to do the review and description editing in less time. Many authors would like to get help from other developers to improve their packages. They can get feedback from the users in the respective package support forums in PHP Classes but sometimes they prefer to get feedback in the sites where they have the repositories hosted. 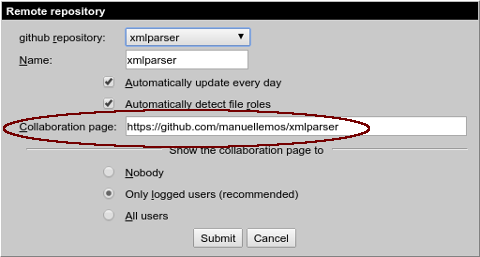 So from now on, if you are importing packages from a version control repository like Git, you can also specify the collaboration page where your potential collaborators should go to join your efforts. For packages imported now from GitHub, the site automatically fills the collaboration field for you. A link to the collaboration page will appear in your package page before the detailed description. For many authors, the nomination for the PHP Innovation Award is an important achievement in their lives. There are many sites that publish PHP packages but I do not know many (or any) that provide recognition to those that are innovative. 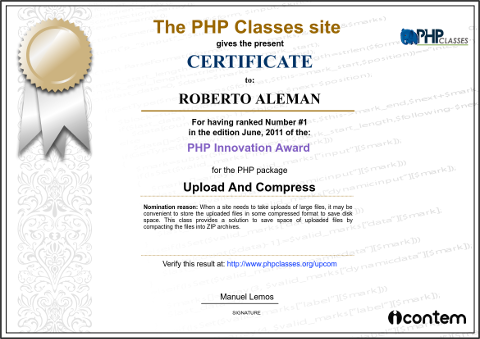 Therefore I got a suggestion from two contributors, Robert Aleman and Dave Smith, telling that the site should provide some kind of certificate demonstrating the achievement of being nominated or having won the PHP Innovation Award. Therefore these certificates are being generated now for all nominees, past and present. The site will serve the certificates in the form of PDF files that the authors can download and print by themselves, and even put it in a frame if they want to. The certificates are being issued. Each nominated author will be notified to come and download their certificate whenever they want. For now you can see a preview of how a certificate looks like. It includes a link to the nominated package page, so anybody can verify that the certificate is valid and the achievement was not forged. After talking with many authors, several of them suggested that the site design should be redone. This is an interesting suggestion but sometimes it is vague. I have not yet decided what exactly will be done, but I am still taking notes from the comments of many of the authors that made this suggestion. Obviously a full site redesign may not be feasible because the site is very large. But specific suggestions for redesigning certain aspects are always welcomed. Most of the features mentioned above were suggested by site users. So if you have specific suggestions, please comment below or mail me to info at phpclasses.org . Finally I would like to comment on a new project that I carrying in parallel with PHP Classes. I will probably come back to this topic later with a more specific post but let me give you an overview. Since 2001 I have been working exclusively in the PHP Classes as my only business and source of revenue. I fulfilled a dream that I always wanted to pursue that was to work only on my own software project, working from home always close to my family (since my son was born in 2001), without putting up with bosses that make you do things that are boring or do not look quite right, etc..
During all these years I learned a lot about what to do and specially what not to do, as I did many, many mistakes that you should not repeat. Many developers already tried to create their own software product businesses but failed. Others do not even try to start a product business because they fear to fail as they do not know enough about business to fill confident to move ahead. The fact is that schools do not teach developers how to create businesses based on their software product. They just teach them how to be employees of somebody else that will get rich from the work of the developers. It is is time to change that and empower developers to create software product businesses that succeed. So, if you also wish to create your own business, working for yourself instead of just making the others rich, work from anywhere you want, at the time you want, I have good news. I am putting together a course to share all I know about that. The course will include free consulting to assist you in making your own software product business dream come true. You will learn how to pick the right type of software product to build, how to pick partners, how to find customers, how to market and sell your products, etc.. This is specifically targeted only to software developers like you and me. So for now if you are interested mail me to info at phpclasses.org so you can get early access to the plans and the draft of the course. If you read this article this far, thank you for your patience. The PHP Classes site has been a huge adventure for me and also a great privilege to help many users to share their work in meaningful ways. But I have to confess that I am tired mostly because most of the work to make it happen was all done by myself. Over the years the work only increased. I want to slow down and get more rest than what I have been having. For all these years I hardly had real vacations. This is one of the reasons that I want to move on with the course I mentioned above. While the PHP Classes site generates enough revenue to keep me working on it, it is not enough to hire additional people to split the workload and also fund the production of better content, like for instance quality articles. I am happy with what I achieved, but the most important was the collaboration of many thousands of contributors that wanted to benefit from the exposure the site provides them. So lets continue to make the site better and keep sending your great packages for the joy of all of developers that are using and learning from them. If you have more suggestions or questions, post a comment here.